It's not especially unusual for someone to to compare the governing political party to a criminal gang – that's every day somewhere on Twitter, right? – but when the person making the comparison is a respected legal commentator and he's quoting the Crimes Act, that's noteworthy. And then let's imagine this scenario: a gang member makes an complaint to the police that another gang member has stolen some of her property. One of the gang's leaders then comes to the complainant's home and tells her that her complaint makes the gang look bad, that it's causing friction between the membership and that if the accused gets convicted and jailed it will hurt the gang in its future battles with rival gangs ... so she might want to withdraw the complaint as it would be difficult for her and her family if she doesn't. What do we think the police should do if they are made aware that such a conversation has taken place? And why does it change things if instead of a gang leader, we instead have a claim that a member of a political party board is involved? A story about an MP who behaved as a nasty bully towards his staff has clearly become something bigger and broader in the effort to politically manage it. It also now equally clearly takes in Bill English, Prime Minister and Barclay's predecessor as MP for Clutha-Southland, whose character is cast in serious doubt. In short: in order to make a political problem go away, he seems to have been happy to throw under the bus the staff who had loyally worked for him for 17 years. In recent hours, the Prime Minister has invited us to believe that while he might have known that Barclay had secretly recorded his staff, he just can't remember who might have told him. And yet he knew enough to approve the use of money from the Parliamentary leaders' fund to pay former senior Electorate agent Glenys Dickson what he described in texts obtained by Reid as a "large" settlement "to avoid potential legal action". As Graeme Edgeler explains in Sam Sachdeva's accompanying story for Newsroom, it's not illegal or even inappropriate for the fund to be used to settle an employment dispute, given that it can be used to hire staff. But for the public to make a judgement on such a use of its money, the public needs to know about it, and ... we didn't. Gallery correspondents have been swiftly on the case, with Audrey Young declaring that "now about the Prime Minister, trust and credibility" and Patrick Gower writing that the user of the leaders budget "for taxpayer hush money is an absolute breach of privilege." But this story does also demonstrate the limitations of relying on Gallery staff for political reporting. 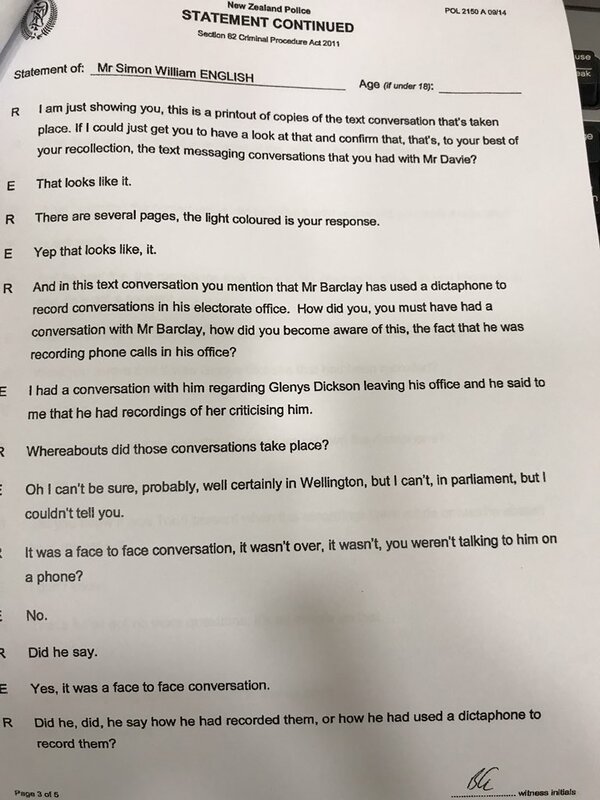 It was the Otago Daily Times reporter Eileen Goodwin (working in cooperation with the Herald's David Fisher) who broke the story of Barclay's refusal to cooperate with police more than a year ago, and Goodwin who revealed that the "employment matter" involved a clandestine recording. Barclay survived a selection challenge last November and everyone pretty much moved on to whatever the next day's political story was. But Melanie Reid didn't, and she worked at it and won the confidence of both Glenys Dickson and former electorate chairman Stuart Davie (who had hitherto refused comment after resigning in April 2016) – and she got a very important story. We deserve to hear more about why Barclay was able to make a police investigation go away by simply refusing to talk to the police (after he had assured the public the police would have his full cooperation). But I think that underlying this story is something that sometimes gets a government into trouble but quite often doesn't: arrogance. It was there in Nicky Wagner's idle tweet about the tedium of having to do her well-paid job serving the interests of New Zealanders with disability. And it appears to be there in spades in the way that ordinary people doing their jobs were brushed aside to defend the reputation of the governing party and its would-be wunderkind.